Huey Long transformed politics in Louisiana from a virtual aristocracy to a true democracy. He broke the wealthy elite's stranglehold on Louisiana's government, which had effectively disenfranchised the poor majority for centuries. Armed with education, transportation and the vote, Louisiana's masses gained unprecedented opportunity to better their lives and would never again be subdued. 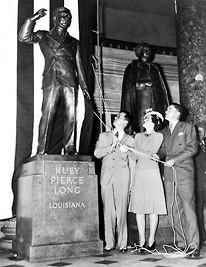 Long's ousted foes tried to label him “a threat to democracy,” because he amassed such personal power in his quest to “share the wealth.” In actuality, a grateful public credited Huey Long with bringing true democracy to Louisiana. After Huey abolished the poll tax, hundreds of thousands of new voters flocked to the polls to take control of their destiny. The number of people voting nearly doubled in the first election after the poll tax was repealed. Within ten years, the number of registered voters doubled again. Finally, “government of the people, by the people, and for the people,” as mandated by America's founding fathers, had come to Louisiana. It was a novel concept in Huey Long's era that government should give the disadvantaged a helping hand. In Louisiana, this new philosophy of government became known as “Longism,” and it is a vision of governmental responsibility that split Louisiana politics right down the middle. For decades after Long’s death, Louisiana remained divided between two distinct political factions, the Pro-Longs and Anti-Longs, mirroring today’s Democratic and Republican parties. Like a seesaw, the two sides perennially came in and out of power, resulting in a workable balancing act between social responsibility and fiscal restraint. In 1940, following the administration of Gov. Richard Leche, the people elected their first Anti-Long governor, Sam Jones. He kept the welfare services begun by Huey Long but reduced the size and power of state government. Jones instituted a civil service program to replace the political patronage system and left office with a $15 million surplus. 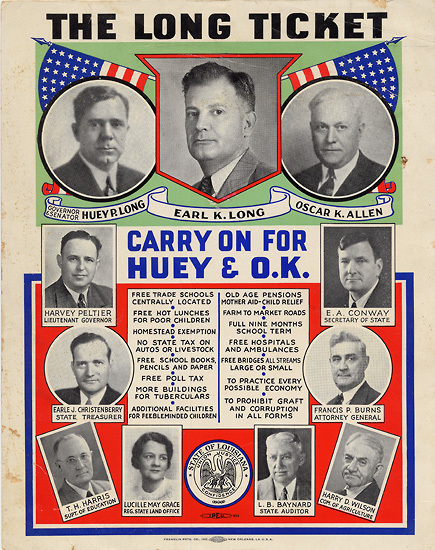 In 1948, Huey's brother, Earl K. Long, was elected governor. Huey's wife, Rose, and son, Russell campaigned for Earl’s election. 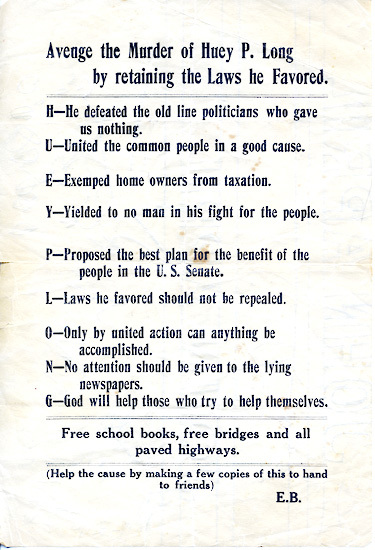 Thoroughly Pro-Long, Earl's slogan was “Service to the People,” referring to his predecessor's philosophy as “do-nothingism.” While continuing to build roads, Earl focused on employment, job training, higher salaries, education, hot school lunches, trade schools, charity hospitals, old age pensions, and veterans' bonuses. 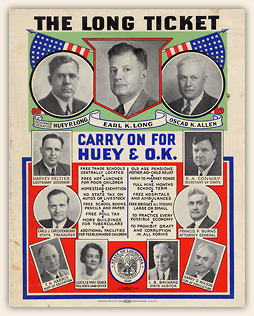 After Huey Long liberated Louisiana politics, a healthy trend developed of high voter turnouts alternately electing Pro-Long and Anti-Long candidates. Louisiana's people truly own their politics and government, with one of the most inclusive, participatory, and colorful political traditions in the United States. 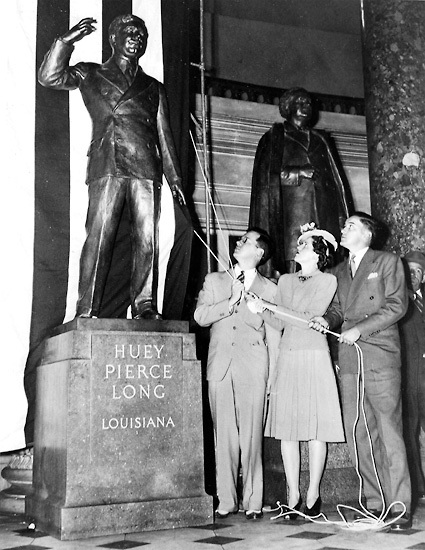 Huey Long's children, Russell, Rose and Palmer, unveil his statue in Statuary Hall of the U.S. Capitol. "The Long Ticket: Carry on for Huey and O.K. 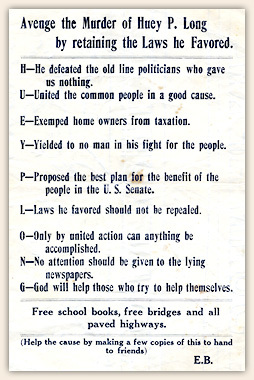 [Allen]" - poster from Earl Long's 1940 campaign for governor. 'Avenge the murder of Huey P. Long by retaining the laws he favored' - anonymous circular.